Unicorn Dips His Horn tapestry shows the mystical unicorn, surrounded by hunters, dipping his horn. 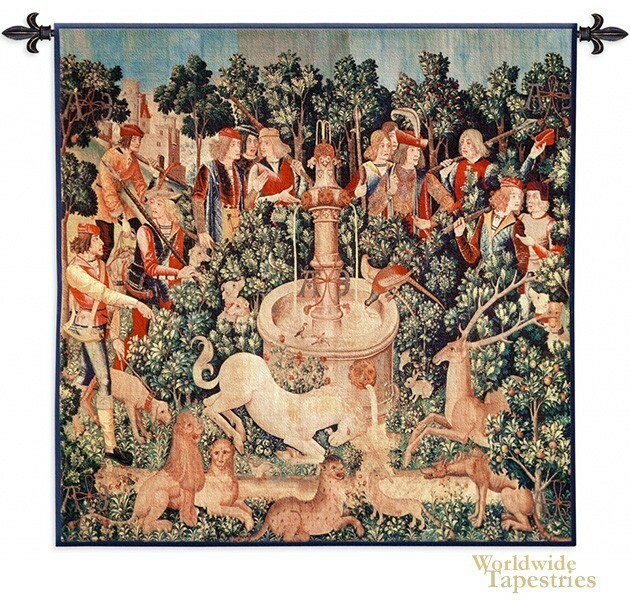 This is a scene taken from the Hunt of the Unicorn tapestry series originally woven between 1495-1505, a Renaissance art tapestry now in at The Cloisters museum in New York. The originals were made in the Netherlands. Here we see the unicorn cleansing the river of impurities, enabling the other forest animals to drink from it. There are stags, cheetahs and hounds watching, as are the royal hunters in bright attire. The entire scene is decorated with rich foliage. This scene is also called the Unicorn is Found. This Unicorn Dips His Horn tapestry is lined at the back and has a tunnel for easy hanging. Note: tapestry rod and tassels, where pictured, are not included in the price.